Below is a collection of domains for Markovian decision-making models. Using real-world road data provided by OpenStreet Map (OSM), this domain requires balancing two objective functions: speed and time spent autonomously driving. Lexicographic Partially Observable Markov Decision Processes (LPOMDPs) naturally capture this problem. They place a lexicographic preferences over the optimization of value functions, and allow for slack in their optimization. Wray, Kyle H. and Zilberstein, Shlomo. "Multi-Objective POMDPs with Lexicographic Reward Preferences." Twenty-Fourth International Joint Conference of Artificial Intelligence (IJCAI), Buenos Aires, Argentina, July 2015. 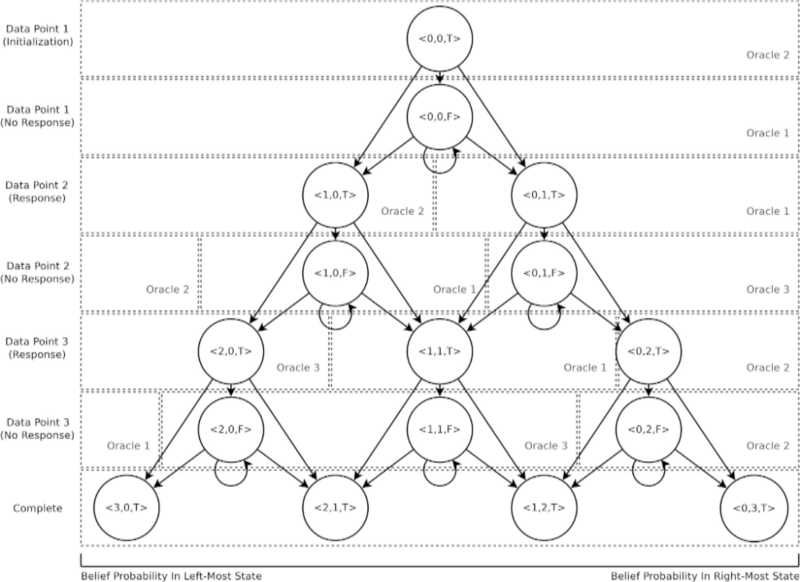 A POMDP model which solves proactive learning -- a generalized realistic active learning scenario with multiple, imprecise, irresponsive, cost-varying oracles. Applications range from scientific experiment selection to medical diagnosis laboratory test selection. Wray, Kyle H. and Zilberstein, Shlomo. "A POMDP Formulation of Proactive Learning." Thirtieth Conference on Artificial Intelligence (AAAI), Phoenix, AZ, USA, February 2016.